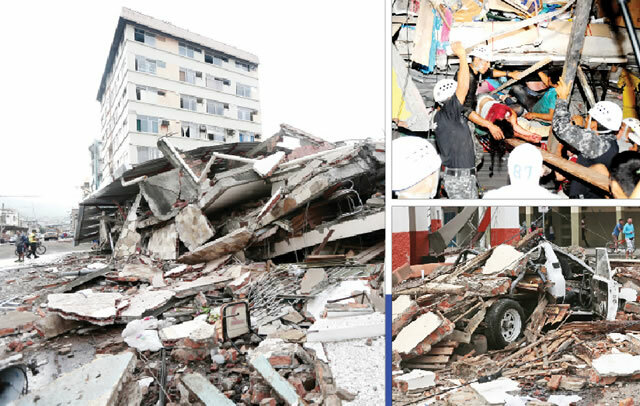 At least 238 people have been confirmed dead, with hundreds more injured after a 7.8-magnitude quake rocked the central coast of Ecuador, Sky News reports. A state of emergency had been declared in six provinces and the government said the death toll was expected to rise. Ricardo Peñaherrera of Quito’s emergency management office said no fewer than 1,500 people were injured. “It was the worst experience of my life. Everybody in my neighborhood was screaming saying it was going to be the end of the world; it was very terrible here,” he said. Five helicopters and 80 buses are taking 4,000 police to the affected area, according to the country’s home ministry. Authorities say the quake is the most powerful to hit the country in decades. It has caused “considerable damage” near the epicentre, as well as in the country’s biggest city of Guayaquil. Parts of the capital, Quito, were also without power or phone services for several hours. A tsunami alert was issued but later lifted. Hydroelectric dams and oil pipelines in the OPEC-member nation have been shut down as a precautionary measure. In Pedernales, a town of 40,000 near the epicentre, looting broke out after dozens of buildings were flattened. Passengers at Guayaquil airport ran out of terminals when they felt the tremor. “Lights fell down from the ceiling. People were running around in shock,” said Luis Quimis, 30, who was waiting to catch a flight to Quito. Among those killed was the driver of a car crushed by an overpass in Guayaquil. President Rafael Correa, has cut short a visit to the Vatican, called on Ecuadoreans to show strength while authorities monitor events. It struck at around 8pm local time on Saturday about 173km west-northwest of Quito and just 28km south-southeast of Muisne, the US Geological Survey said. The quake also rattled northern Peru, according to authorities. Across the Pacific in Japan, a 7.3 magnitude tremor struck Kumamoto province on Saturday, killing at least 32 people and causing widespread damage, in the second major quake to hit the island of Kyushu in just over 24 hours.